Each of the thirteen new etudes which comprise this volume have been edited to be performed on ANY BASS CLEF INSTRUMENT. 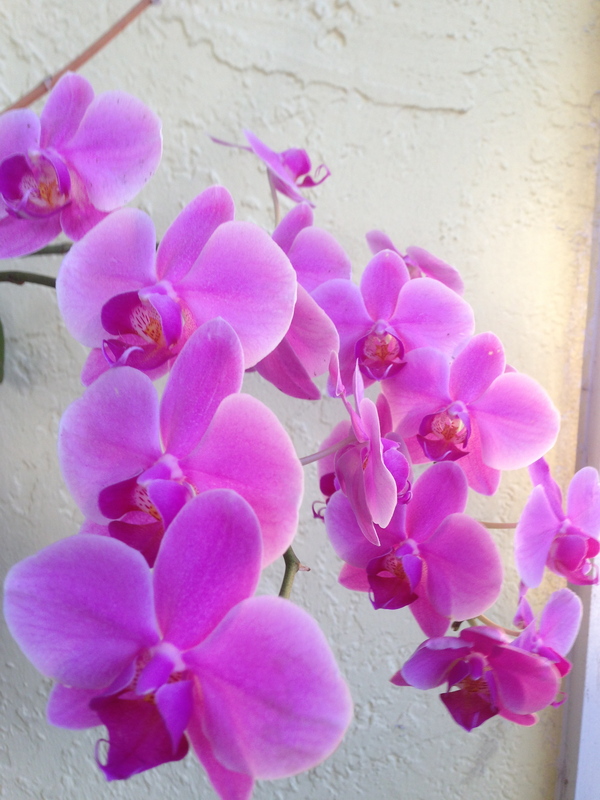 Each etude begins with a simple theme, which is then ‘rhythmatized’ and then adorned with self accompaniment. The simple themes are at the elementary level, and the rhythmic variations gradually progress from elementary/intermediate to intermediate. Ideal for those who would like to develop their skill interpreting modern grooves, become familiar with the Stereogram technique or develop their sight-reading. Vital for those with no access to a jazz ensemble. 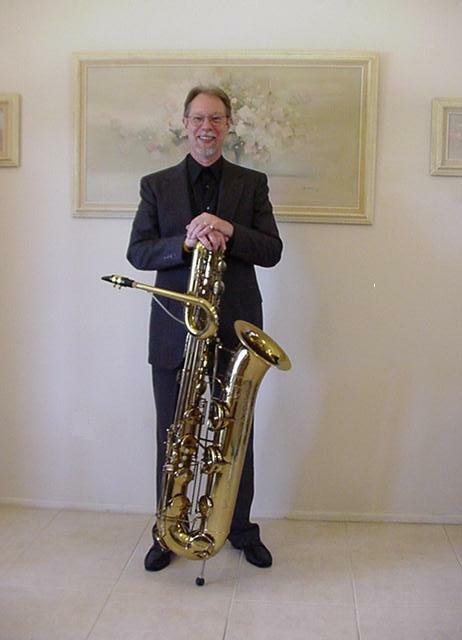 Developed in consultation with noted tenor trombonists, tubists, bassoonists, bassists, and cellists. 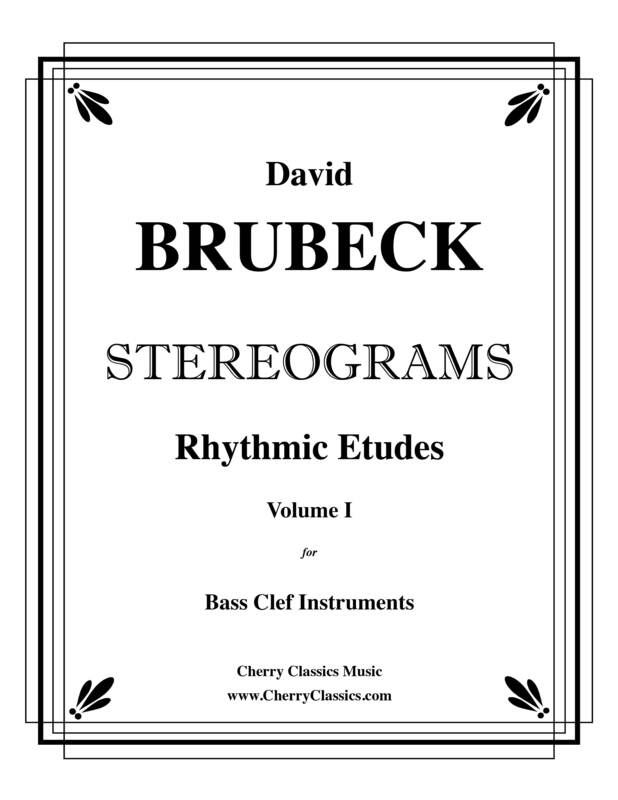 Stereograms for Solo Bass Trombone Nos. 1-20, Fifth Edition. These innovative solos for bass trombone have been presented at the 2010 International Trombone Association Festival by David William Brubeck, published in the International Trombone Journal, recorded by James Markey, Joshua Hauser and Garth Simmons, and performed by Doug Yeo, James Markey and others in recital throughout the world. Rhythmic, self-accompanying etudes which evoke the spirited music of Bobby McFerrin for the bass trombone! 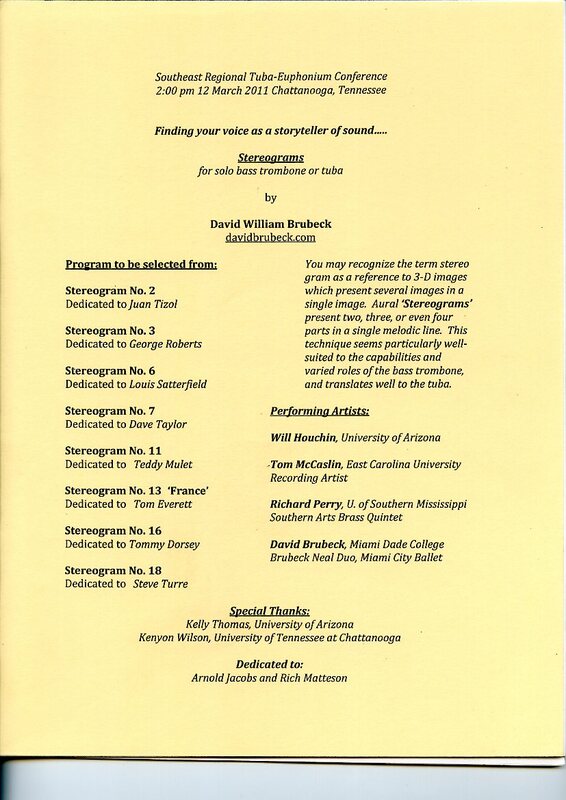 Staple bound and published by the International Trombone Association Press. Available NOW from Hickey’s music and at other fine retailers. Ten more original etudes for solo bass trombone. 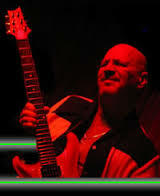 A rhythmic romp through mixed meters and modern grooves via exotic locales. Available NOW from Hickey’s music and at other fine retailers. As presented at the 40th International Trumpet Guild Conference in Columbus, Ohio by DUO BRASS-Craig Morris, Peter Wood, Marc Reese & Jason Carder trumpets with David William Brubeck bass trombone. 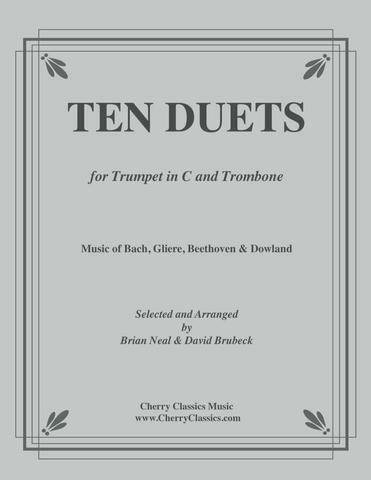 Each of these ten concert duos have been arranged, performed and refined by Brian Neal, solo trumpet of the Dallas Brass, and David Brubeck, bass trombonist. During four seasons, the Brubeck-Neal Duo presented these arrangements in dozens of concerts. A significant milestone in the development of the under-served genre of duo brass. Spiral bound. Available NOW from Cherry Classics! Stereograms Nos. 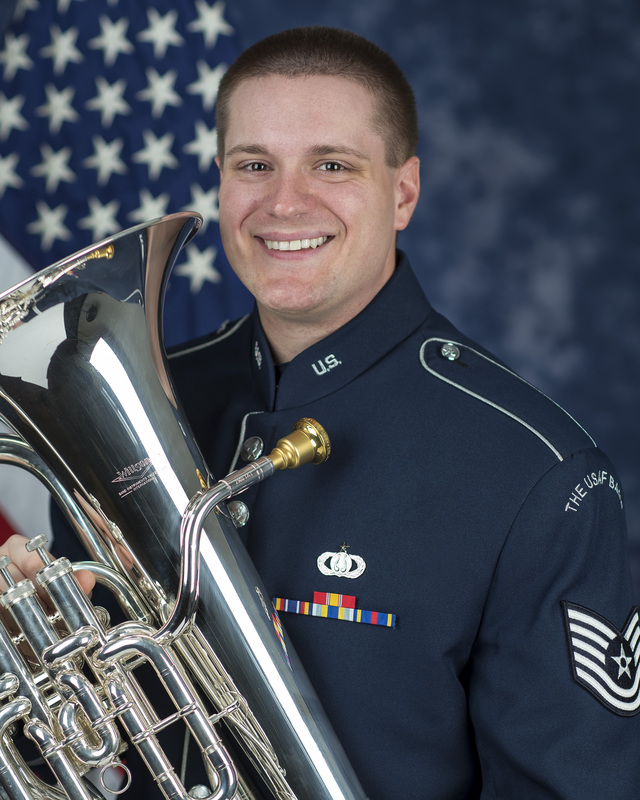 1-20 for Solo Tuba! The availability of Stereograms Nos. 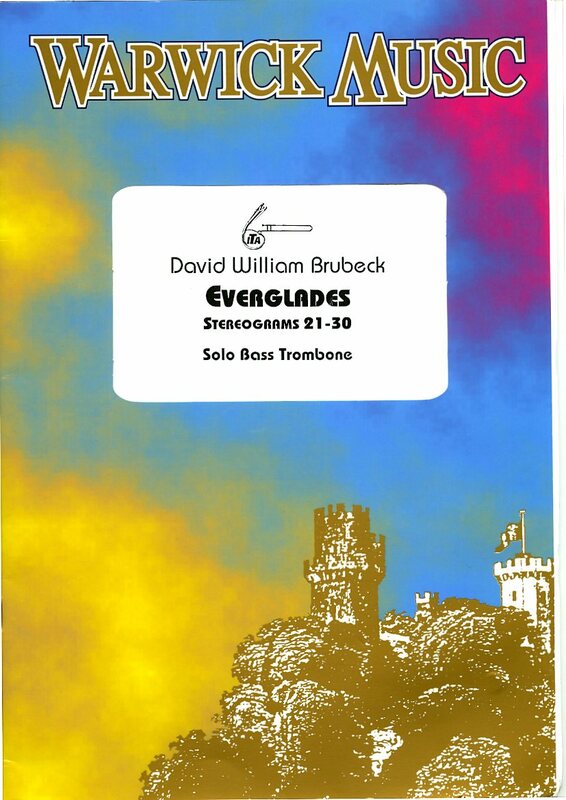 1-20 has extended from the original editions (suitable for bass trombone, euphonium, tenor trombone with ‘f’ attachment, bassoon, cello, or bass), to a special edition for tuba! 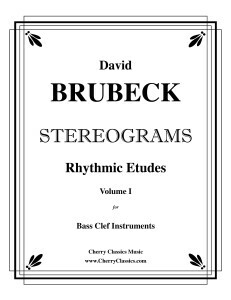 Stereograms have been described as “Bobby McFerrin meets the Bach Cello Suites”, and are rhythmic etudes which contain self accompaniment and give the aural illusion of two or three separate parts within a single melodic line. 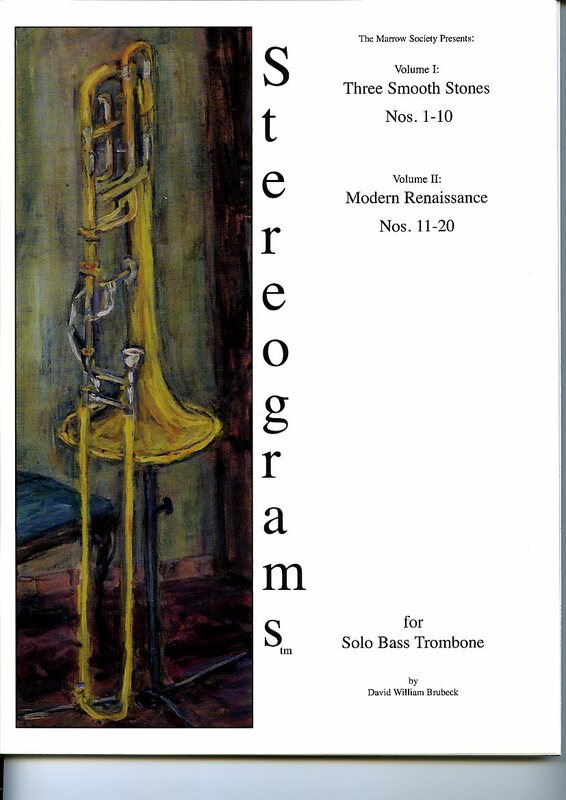 Carefully transcribed and adapted by Professor Kelly Thomas, of the University of Arizona and his former assistant Will Houchin, these lower voiced Stereograms have been recast into appropriate ranges and keys for tuba and are now available for purchase on-line! These are the solos featured at the 40th Annual International Tuba and Euphonium Conference at Indiana University in Bloomington, Indiana where they were introduced by Jim Self and performed by Beth Mitchell, Patrick Nyren, Kelly Thomas and David William Brubeck. 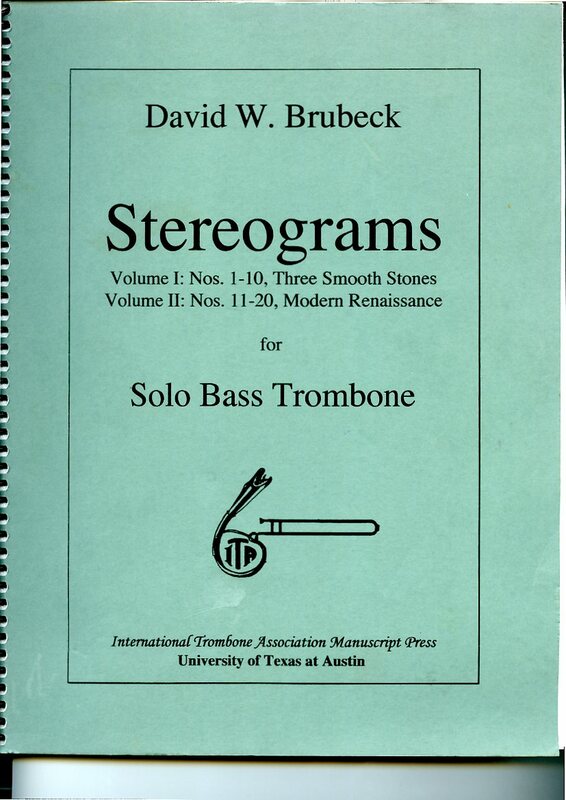 The original Stereograms for bass trombone, adapted for baritone saxophone by Randy Emerick. 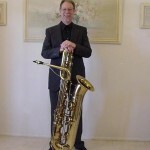 The etudes work well on all saxophones and were used by Fred Hemke at Northwestern University. Published in 1999, this is the original version. Staple bound with cover art by Cecilia Martinez. Association Press and Southern Music. 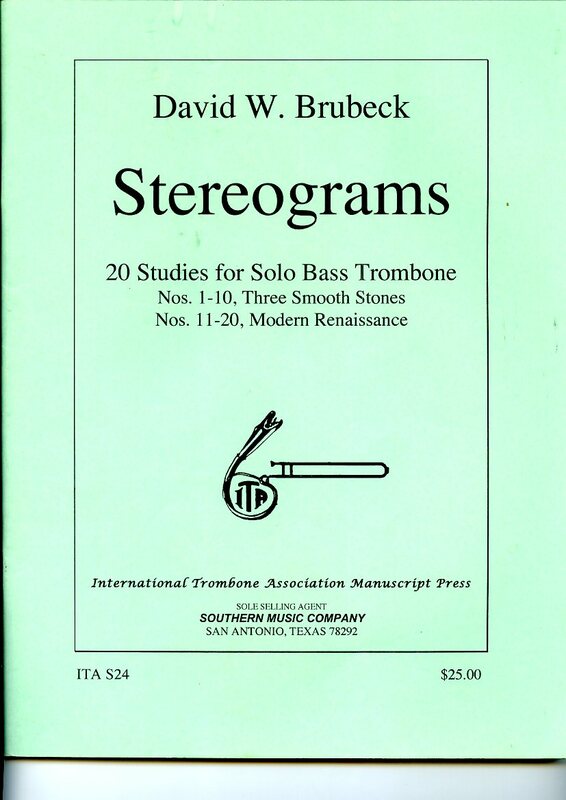 Stereograms for Solo Bass Trombone Nos. 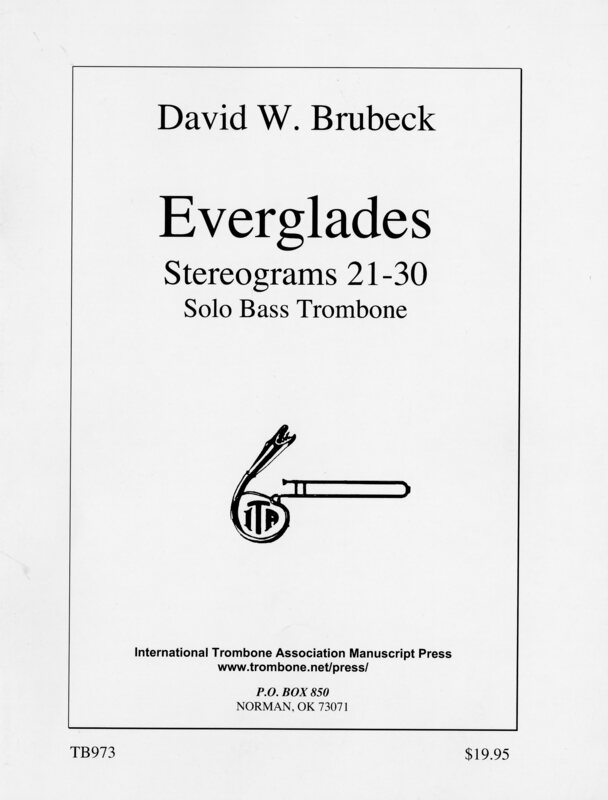 1-20, Fourth Edition.Staple bound and published by the International Trombone Association Press. Association Press and Warwick Music. 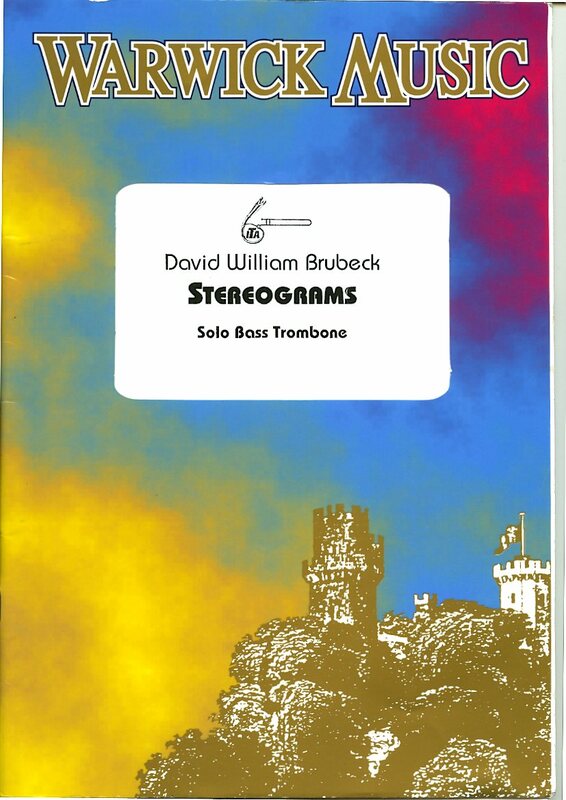 Stereograms for Solo Tuba Nos. 1-20, SERTEC Edition. 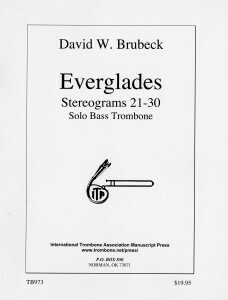 Staple bound and presented at the 2011 Southeast Regional Tuba and Euphonium Conference. Adapted for tuba by Kelly Thomas, Professor of Tuba at the University of Arizona and his assistant Will Houchin. 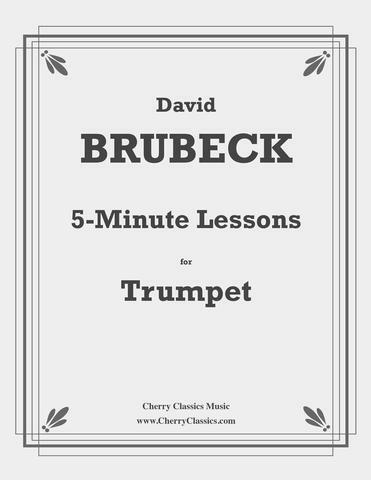 davidbrubeck.com c 2013 David William Brubeck All Rights Reserved.